Ch. Whiteoaks Nanjay In Neon C.D. 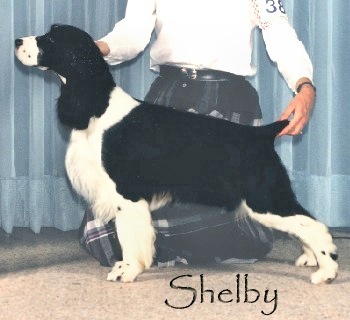 - "Shelby"
Ch. Nanjay's Mercedes For Seaken C.D. 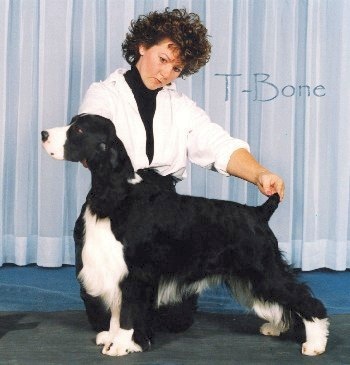 - "Sadie"
I had been so excited by the puppies from the breeding of Ch. 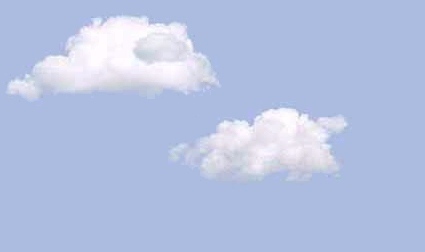 Amanda's Original (Geoffery) and Ch. Nanjay's J.T. Targa (Targa) that I decided to do it again, and this time hope for a girl. All of my wishes were answered in a cute little black and white package "Sadie". Sadie was shown by her co-owner, Sean Kent (Seaken Kennels) and they had lots of fun earning her Canadian Championship and Canadian CD (Companion Dog) title. 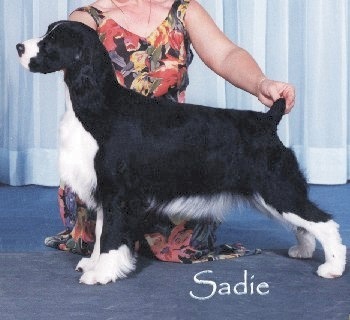 Sadie was bred to two different males, Ch. Serenade's Family Tradition (Cody) and Ch. Nanjay's Noteworthy (Norbert) and produced some magnificent puppies. She is the dam of four Champions. Sadie spent her life as a cherished friend to Sean & Gary, and could even be found getting off the couch, (every now and then) to play with her son, Sigmund! but please don't you cry. and don't say that I'm gone. Ch. Nanjay's Prime Cut - "T-Bone"
T-Bone was shown to his Canadian Championship, and then took a "rest" from the show ring. He started strutting his stuff again, as a veteran, and had lots of fun at the specialties, earning several Best Veteran In Sweepstakes and Best Veteran In Specialty Show awards. T-Bone was the "nanny" here at Nanjay for many years, sneaking into the whelping box to "puppysit" or play with the babies as they got older. He was named in honour of his grandsire, a great Springer, Am. Can. Ch. Canamer Prime Time C.D., T,D,, who passed away around the time when T-Bone was born. T-Bone boasted one of the most beautiful faces I have ever seen, and even at the age of thirteen still had that wonderful, soft, "spaniel" head we all love to look at. In Loving Memory of 'T-Bone'. Another photo of T-Bone, but the "other side". Good friend and handler, William Alexander, had taken him out to the WESSA booster for me in 1990 (when "T" was just a puppy). T-Bone's "off" side was William's favourite -- as that is the side with the white "collar" -- so we just had to have a photo of that! 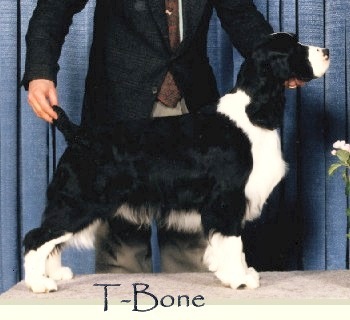 T-Bone had been featured on many English Springer Spaniel Calendars over the years. You can view some of these in our Portraits, Head Studies & Calendar Pics section.